It takes bravery to open an independent pub in the middle of Hull these days. The long-established drinking circuit in the town centre decamped to the avenues area over a decade ago and the pubs that remain are mainly chain or brewery-owned pubs. Only a handful of independents remain and two of those are owned by partners Chrissy Fleming and Alan Murphy. They have been running popular real ale paradise free house Walters Bar for a while now and two years ago purchased the nearby Lion and Key, which they operate in the same ‘only here for the beer’ spirit. 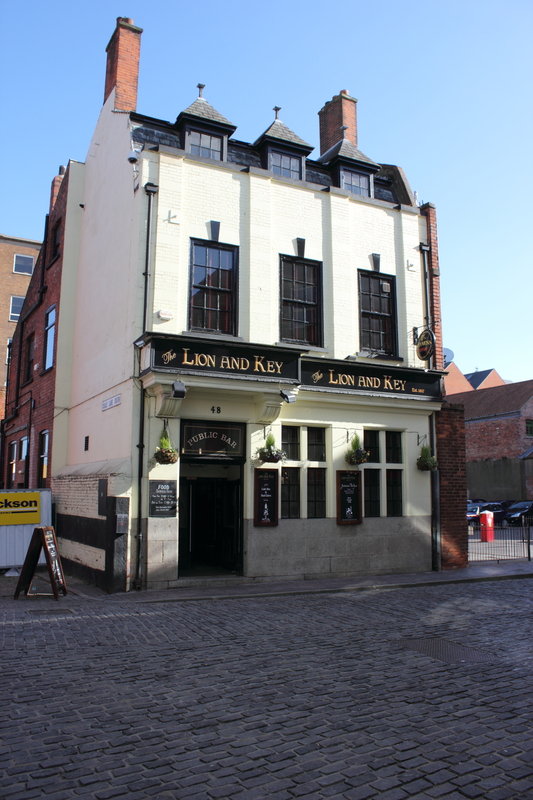 The Lion and Key first opened as a pub in 1817, then became offices sometime in the mid 20th century before reopening as an Irish bar in the 80’s. Chrissy and Alan bought the pub, returned it to its original name and these days offer a selection of 5 mainly local real ales and 3 real ciders. On top of this there is a sizeable selection of spirits from all over the globe and some imported bottled beers. The bar staff know their booze and are only too keen to help you navigate through the options and there are comfy corners or communal high tables to retire to with your weapon of choice. The food is traditional pub fayre – ploughmans, fish & chips etc – but it’s all locally sourced where poss and there are new specials on every day. The provenance of all the specials is outlined on the menu, right down to the fishing grounds the fish came from and the fields where the tatties were pulled. Nice touch. Unusually there are no quiz nights, no music nights and no other such regular events. The idea is that the pub is always the same whenever you pop in; you know you can get a decent pint, grab a bite and have a chat without the atmosphere being too quiet or too loud. An admirable stance which, again, takes bravery to maintain. Chrissy and Alan’s current pubs are about 100 yards apart and they are soon to open another in between. Looks like they might have soon created a town circuit all of their own.